Last December, Twitter launched their version of brand pages which provided the first step towards leveraging Twitter as a destination for brands. While the validity of brand pages in their current form have been questioned based on how users consume feeds vs. actual page interaction, it is clear that this was the initial step in a broader strategy. Today, it was announced that Twitter is now taking the next step with their brand pages offering and will soon allow brands to create specific experiences tied to the brand page, including e-commerce, contests and sweepstakes and according to early reports will be contained within the brand’s tweet timeline vs. a 140 character limit. 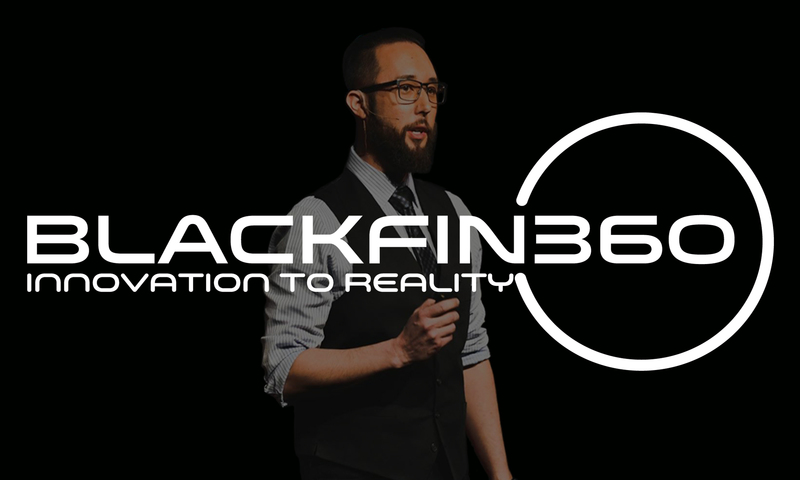 1 – Brand centric activation opportunities – By allowing brands the opportunity to directly tie contests & sweeps to a brand page vs. separate landing pages, their is an opportunity for longer dwell times on a branded presence and more of an opportunity for a user to directly connect with the brand. 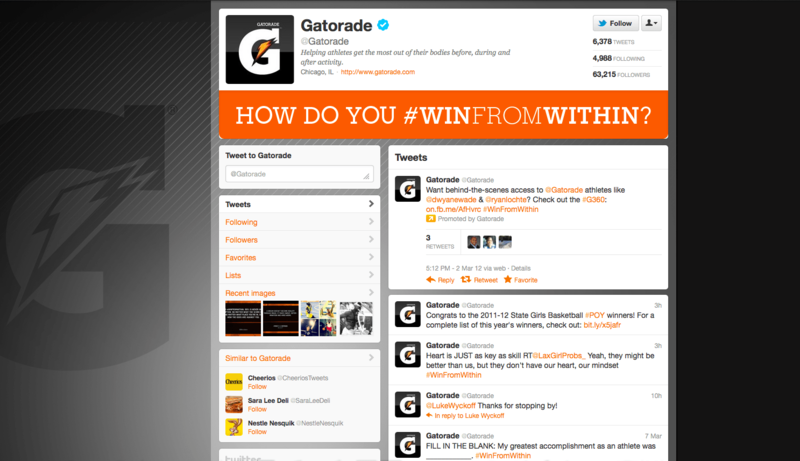 This also provides additional value to brands who have or will invest in Twitter’s advertising platform. 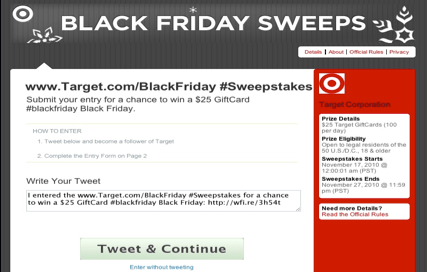 Here is an example of how brands have facilitated Twitter sweeps in the past. 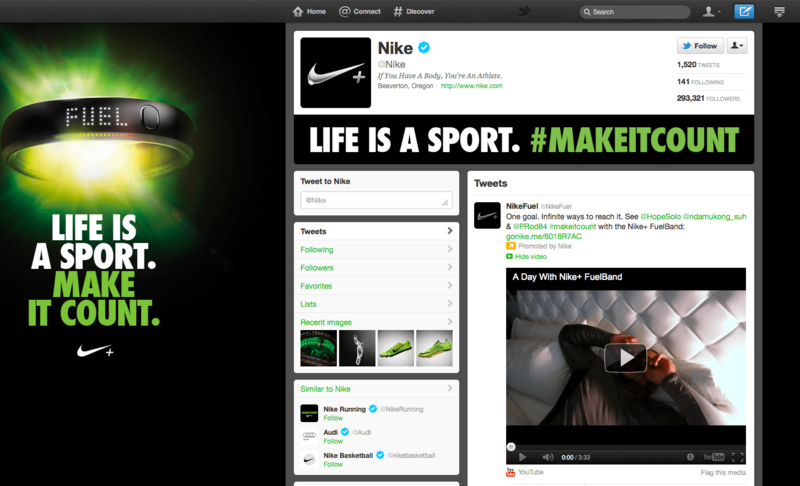 The new announcement will create associations directly with a brands page vs. separate landing pages as shown below. 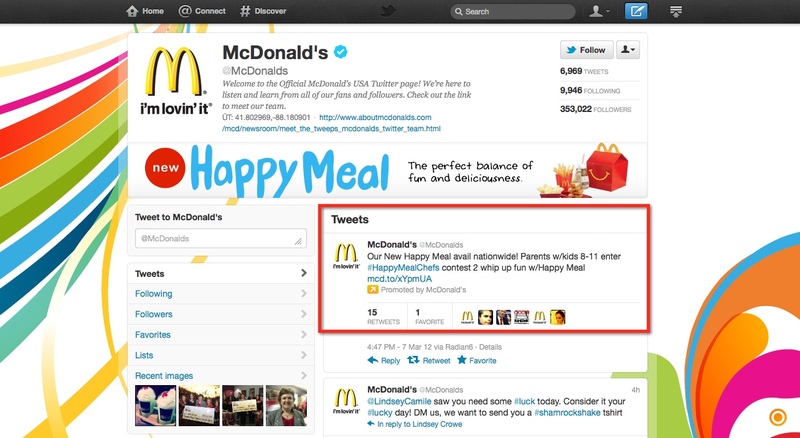 McDonalds is already using a combination of pinned & promoted posts & a Hashtag centric campaign. In the future, this will drill into a Twitter based branded experience vs. micro-site that facilitates deeper brand engagement & also drives a more robust CRM strategy. 2 – Social Commerce – The future connection between Twitter & e-commerce is officially on the product roadmap. Based on the dual role of co-founder Jack Dorsey, who is also the CEO of mobile-payments company Square, we definitely foresee an opportunity to further drive e-commerce interaction that is tied to existing Twitter behavior. This is further fueled by Twitters performance over the 2011 holiday season, where Twitter led the way in average order size over Facebook. 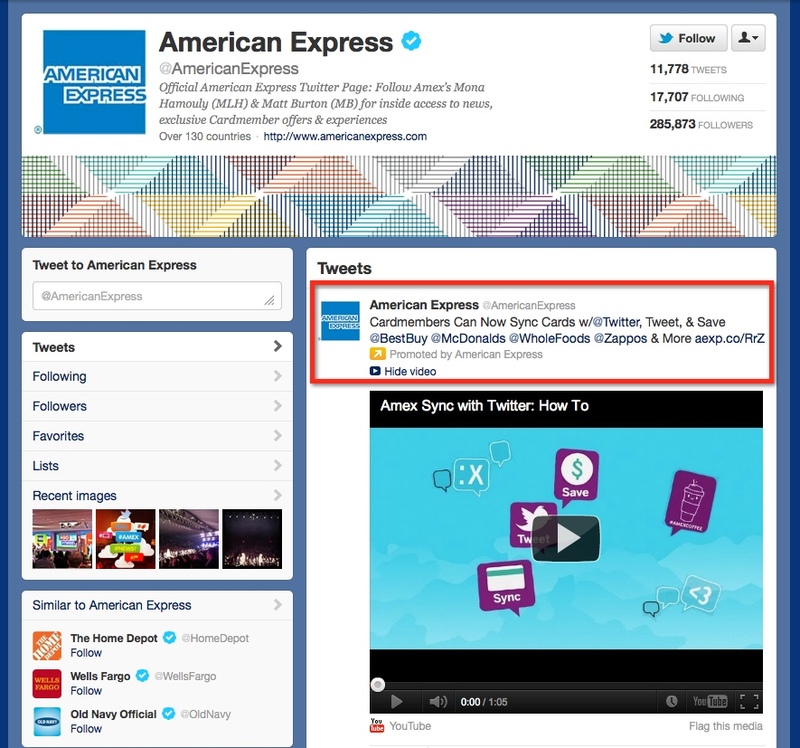 Recently, Twitter partnered with American Express allowing Amex card holders to sign up for a service that ties a users tweet via a Twitter hashtag, or search term, that’s unique to a specific offer. After the user makes a purchase, deal savings are automatically credited to that customers American Express card statement within one to three days. 3 – Destination vs. Portal – Since inception, Twitter has performed as an aggregation hub or portal vs. a true end destination for users. This is supported by the amount of overall referral traffic Twitter creates. By connecting branded destinations with branded acquisition enablement vs. simply aggregating content, advertisers can now create more robust programs via Twitter by providing an end destination within Twitter vs. driving to Facebook or other owned channels. 4 – Connect Organic & Paid Content – This move will also greatly lift the importance of Twitter’s ad programs as brands can leverage promoted tweets and other ad types to drive brand engagement directly with their branded presence. 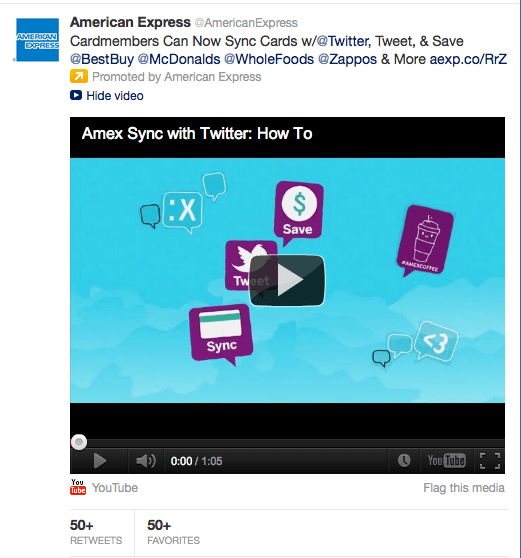 Those brands that incorporate promotion with natural extensions of Twitter’s most compelling engagement techniques will be the ones to truly capitalize on additional engagement & acquisition rates. While Twitter has a ways to go in order to rival Facebook in terms of direct brand interaction, today’s announcements show Twitters dedication to continue to enable brands by providing more opportunities for users to interact directly with a brands presence vs. simply consuming their feeds. NOTE: It should be noted that only brands that spend a minimum in advertising are eligible for brand pages.